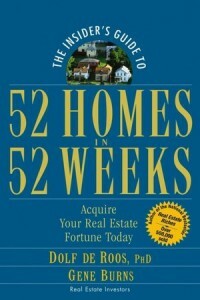 The Insider’s Guide to 52 Homes in 52 Weeks: Acquire Your Real Estate Fortune Today The door is open for anyone interested in acquiring a real estate fortune, thanks to a new book that shows how. To counter the suggestion that great deals are the exception and not the rule, best-selling author Dolf de Roos and Gene Burns challenged themselves to buy one home every week for an entire year. They acquired these properties using a variety of financing and acquisition techniques, which they document in “The Insider’s Guide to 52 Homes in 52 Weeks”. The book doesn’t just chronicle what they did and how they did it. It also shows readers how they can take these techniques and apply them to their own acquisition program, whether they want to buy one house a week or just one a year. In the beginning, the authors looked for pre-foreclosure homes and then feverishly tried to find tenants for them. Towards the end, they signed up tenants and then found houses for them to move into. Topics in the book include how to determine your strategy and getting started; learning to ask for help; finding the right location; lease options; owner financing; pre-foreclosure and many more. American Theocracy: The Peril and Politics of Radical Religion, Oil, and Borrowed Money in the 21st Century In his two most recent books, American Dynasty and Wealth and Democracy, Kevin Phillips has perhaps rightly earned the prestigious moniker of America’s premier analyst and critic. Now, in his new release, a doom and gloom tome some 480 pages long, Kevin Phillips assails three overlapping, growing, forces that threaten to rain on the parade of the American way of life. 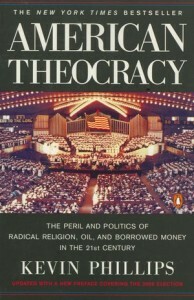 Actually, American Theocracy : The Peril and Politics of Radical Religion, Oil, and Borrowed Money in the 21st Century, is still a great value because it is really three books in one, with just enough threads woven between the very different but often interrelated fabrics to help illustrate the upcoming perfect storm. In Part I of American Theocracy, Kevin Phillips looks at the ramifications of our preocupation of oil, past and present. The book maintains that American supremacy was derived by our exploitation and effective use of a newly useable form of energy on the world stage. While other nations were trapped in their inertias of coal, wind and water infrastructures, America quickly realized the versatility of this black gold and leveraged a nation around it. In fact, with only roughly five percent of the world’s population, Americans still consume over 25 percent of the world’s oil. But supply of this precious resource has always been a concern. American Theocracy points to World War II especially, which was waged by Japan and Germany to secure their hold on this vital fossil fuel for modern economies. The book takes care to explain that America itself has been heavily involved in its own petro-imperialism over the last century. Moreover, the life blood of our economy is becoming more difficult to find and extract even as the world economies are demanding more. One little know fact in all of this, as other Middle East supplies are being exhausted, is that Iraq is the last large pool of oil on the planet. And all of this still virtually untapped, near the surface. American Theocracy describes how Iraq has never been able to pump much of its oil, with U.N. sanctions in the 90’s, war with Iran in the 80’s and so forth. With the thinly disguised cloak of spreading democracy and fighting terror, it is of little surprise, given our history of petro-imperialism in the Middle East, and the fact that there is an estimated one trillion dollars in estimated profits for the (American) companies who will pump it, that we found ourselves with troops in Iraq. In Part III, American Theocracy contends what is the traditional hallmark of an overextended world power: over consumption and massive public and private debt.Huge trade deficits, trillions of dollars in national debt and financial speculation, made worse by the influence of big business and Wall Street on Washington only serve to exacerbate the problem. The Republican Party, once the icon of sound fiscal policy, has discarded its ideals by mortgaging our country’s financial health and future to the whim of other countries in order to fund and maintain our status quo around the world.